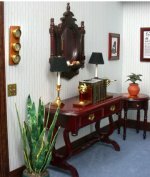 This is a complete room box, with a glass top and front that are removable. All items shown are included. The exterior of the building is finished in brick. 9 1/4" x 15" x 23 1/4". The bookcases on the back wall are filled with our own decorations. 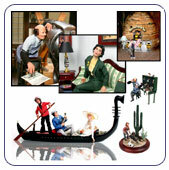 The included Desk Set, Magnifying Glass and Telephone are all listed in our catalog. On the side wall view you can see the Weather Station, Armillary Bookends and a pen and ink framed drawing.